This piece was originally published on the WLE Thrive Blog in honor of the International Day of Rural Women, celebrating the vital role that women and girls play in agricultural production, food security and nutrition, land and natural resource management, and building climate resilience around the world. For decades, global and regional forums, such as the Convention on the Elimination of All Forms of Discrimination against Women, Beijing Declaration and Platform for Action, AMCOW, Nile Basin Initiative, have declared the intention to empower women to have equal decision-making power over water and other natural resources. The findings of years of research, in the form of case studies, subject-based workshops and various guidelines for implementation, point out ways for how this could be achieved and explore the diverse positive impacts this could have. Yet, women continue to be marginalized in irrigation schemes of all sizes and across many regions of the world. This is true in irrigation projects regardless of whether they are public funded or donor supported (even those that aim to improve women’s incomes). So how do we translate the grand aims of gender transformation into practical action at the irrigation scheme level to strengthen women’s decision-making and make sure they secure more of the benefits? In answer to this question, the International Water Management Institute (IWMI), supported by the CGIAR Research Program on Water, Land and Ecosystems (WLE), has developed the Gender in Irrigation Learning and Improvement Tool (GILIT). GILIT offers an integrated, participatory approach for measuring gender equity in irrigation schemes, facilitate learning and help identify ways to improve equity. Photo: Close up of a women farmer irrigating a field of maize mixed with groundnut. Credit: David Brazier/IWMI. GILIT is based around a set of indicators that focus on three critical themes in gender and irrigation: access to resources, participation in decision-making and access to benefits. Through GILIT, water user association (WUA) members and other stakeholders score themselves, share views on gender equity within a scheme and proposed ideas for improving it. This provides insights at irrigation scheme level rather than relying on national level gender equity indexes. And, in so doing, it provides an opportunity for women and men to develop practical measures that establish greater equity in and for their own context. GILIT integrates research-based evidence with the principles outlined in regional declarations for women’s empowerment in the water sector, thereby helping to ensure it aligns with contextual aspirations. GILIT has been piloted in Uzbekistan and Malawi. In Uzbekistan, IWMI partnered with irrigation water user associations on six large irrigation schemes and Nazar Business and Technology. In Malawi, IWMI partnered with the academics from the University of Malawi, the Agricultural Extension Service and smallholder farmers in the Kaziputa and Lufilya irrigation schemes. To find out more, explore the results of these pilots in the WLE R4D Learning Series report. The pilot highlighted similarities as well as important gender inequity differences across socio-economic contexts. In Uzbekistan, women produce the majority of food on small household plots. 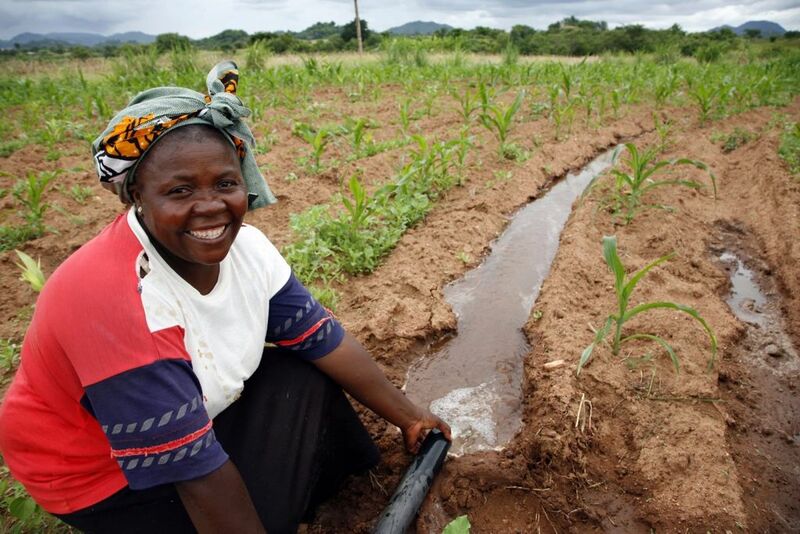 Rather than supporting food security by providing women with water, irrigation schemes tend to focus instead on supplying large farms producing fiber and grains that are managed primarily by men. Although women want access to more water, they have either no or a limited role in Water User Associations and limited voice in irrigation scheme decisions. “Women know the needs of the family for food security … The household level is very important, where women play a critical role as managers of resources and putting resources into benefit,” said a woman from an irrigation scheme in Uzbekistan during the GILIT process. Through the pilot, GILIT enabled women to express their needs in various irrigation schemes, explaining where and when they needed water for vegetable production. In Malawi, leadership in irrigation schemes was highlighted as a key issue. “It would be okay if a woman was chair or vice-chair, but then we would demand that [the rules state] a man must take at least one position,” said a man from a Malawi irrigation scheme during the GILIT process. For example, in one irrigation scheme, although women farmers are in the majority none of them currently hold leadership positions. It was agreed by both women and men that this wasn't possible because women lack access to transportation to attend meetings or field demonstrations, which are usually several hours walk away. Photo: Graeme Williams / IWMI. GILIT is not a fix-all solution for gender inequalities. It recognizes that the underlying social context shapes the gender relations on irrigation schemes. It does, however, offer a way for project implementers and scheme managers, in collaboration with WUAs, to assess the level of gender equity and identify areas for improvement. It can also be used periodically for monitoring and evaluation of changes in equity over time as new interventions are applied. As demonstrated by the GILIT pilots in Malawi and Uzbekistan, its use can lead to practical actions for change that go beyond quotas. It can enable an irrigation scheme to more closely align with the gender equity goals of specific projects and at the same time those of national, regional and international declarations. Check out the full publication here. Thrive Blog: Still Marginalized After All these years… Why Are Things Not Changing for Women in Irrigation?